2. Cut the pastry into 4 portions and lay on a lined baking tray. Brush each portion lightly with some butter. 3. In a bowl, mix the almonds, egg, butter and sugar to form a paste. Spread this paste on the pastry portions, leaving a border. Bake in the oven for 5-8 minutes or until the pastry starts to rise. 4. Remove the tray from the oven. Drain the peaches and arrange them over the almond paste. Bake again for 8-10 minutes or until the pastry has risen from the side and is golden. 5. Remove and keep aside to cool for a few minutes. Dust some icing sugar. Serve warm. 6. 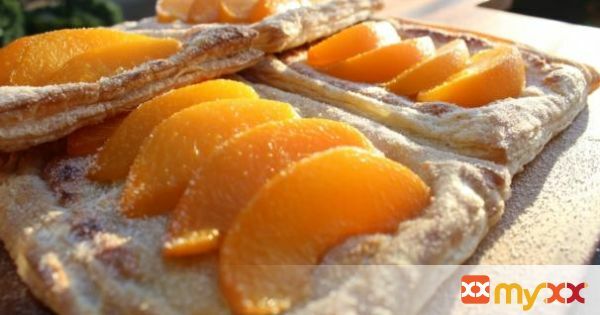 * Since I have used tinned peaches which were already ripe, I have baked the pastry separately first, before adding the peaches and baking again.